Navigating parties, dinner and dogs with a little help from a friend named Pinterest. 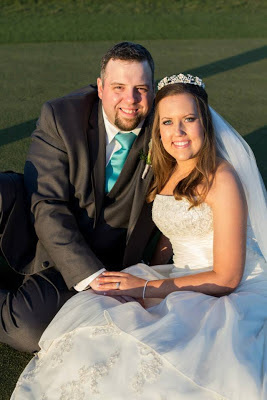 I found a blog on Pinterest written by a recently married bride. She hilariously listed a few things as would have done differently at her wedding. Having a fancy hanger to display her dress was one of those things. 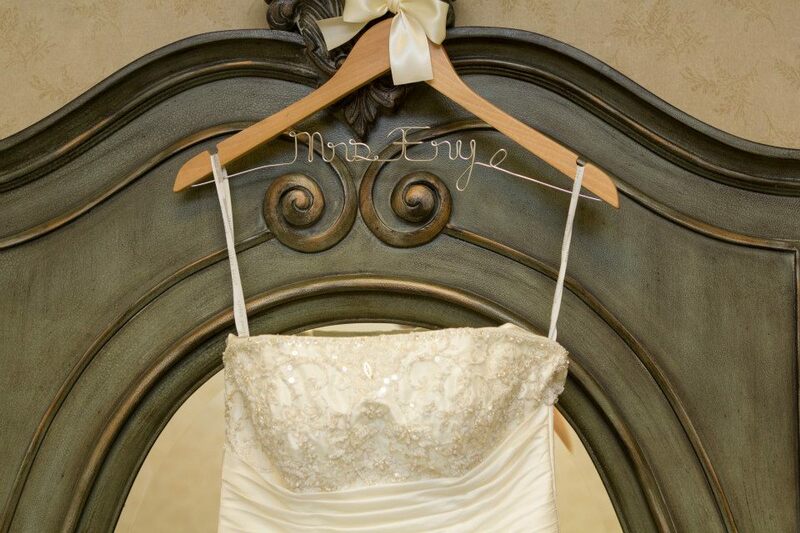 I'm glad I listened to her and got this beautiful Mrs. Frye hanger, with ivory ribbon, from a Etsy shop! Derek and I both have lost a few important family members that, if still living, wouldn't have missed our big day for the world. We wanted to include them all somehow in the wedding. 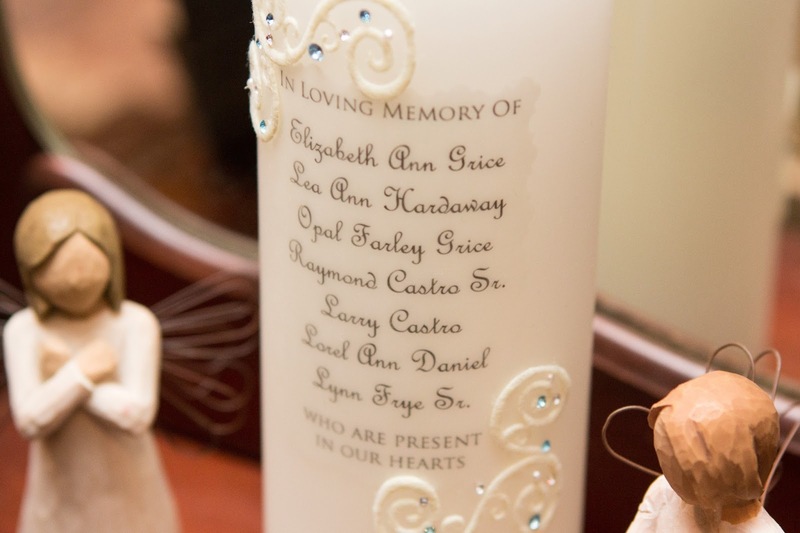 We placed this 'In Loving Memory of' candle on my great grandmothers vintage vanity with a few photos. I came across a pin that featured all the members of a bridal party with different super hero cuff-links. It blew my mind. If you have met Derek then you know he is a little obsessed with Superman. 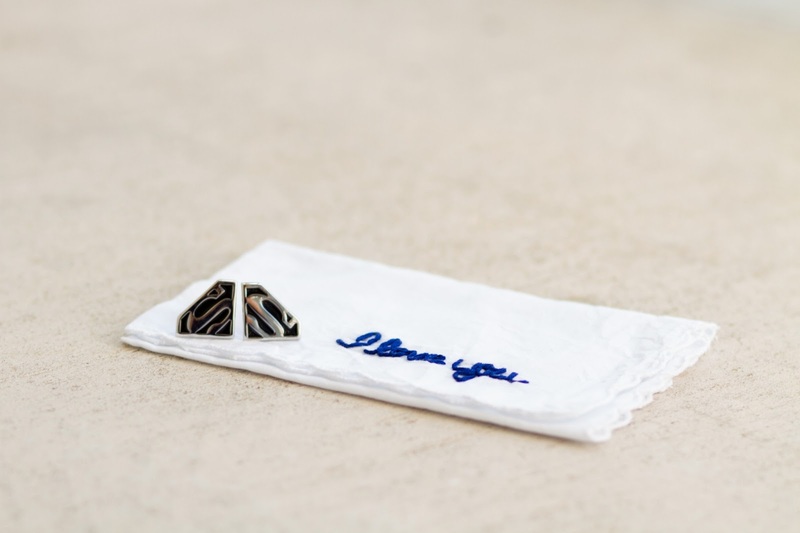 So I included these Superman cuff-links in his wedding gift. A subtle way to show love for his childhood hero. 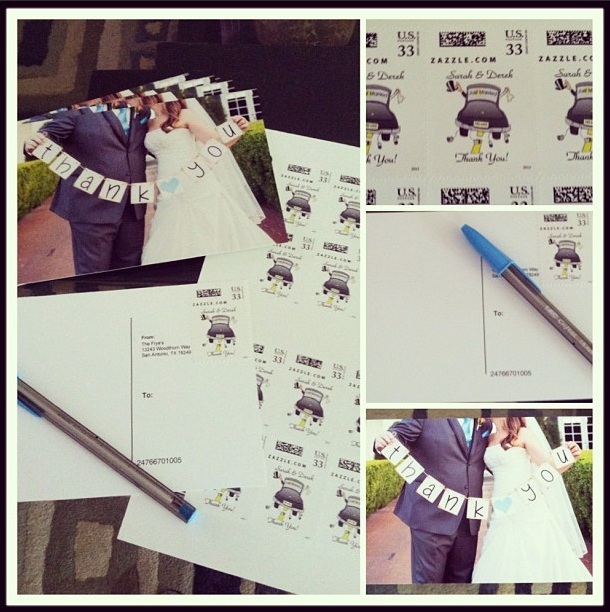 I came across a Pin that listed celebrities you could invite to your wedding and get a card in return! I invited about 5 different celebs/public figures and got two cards back in return. One from Minnie and Mickey Mouse and the other from the President and First Lady. It was really cool to find these in our mail box. I could go on and on but I pretty sure you are over my wedding by now...right?? Until next time, Keep Pinning. Since April 20th Derek and I have been making our house a home. 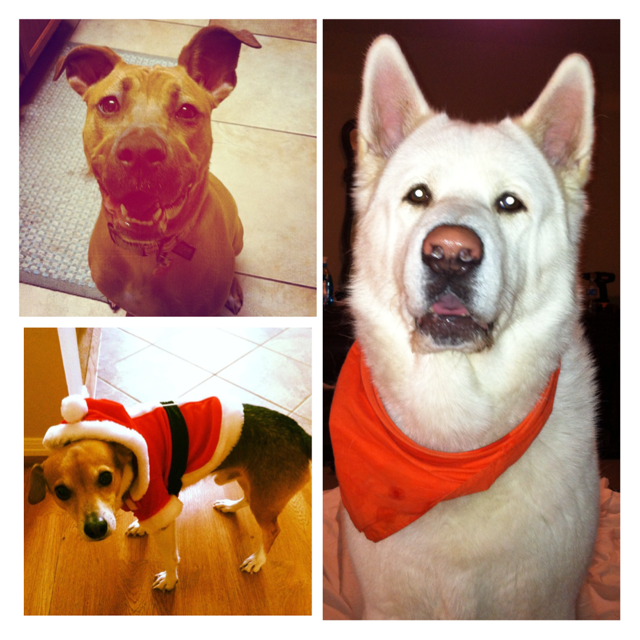 We currently share a three bedroom house (plus a man cave) with our three furry kids, Texan, Dempsey and Princess. I have been decorating a cleaning like crazy. Here are a few things I did in our house that I found on Pinterest. I travel for work every 6 weeks and love to meet up with friends for adventures. Over time I have collected little bottles of shampoo, conditioner, soap and mouthwash. 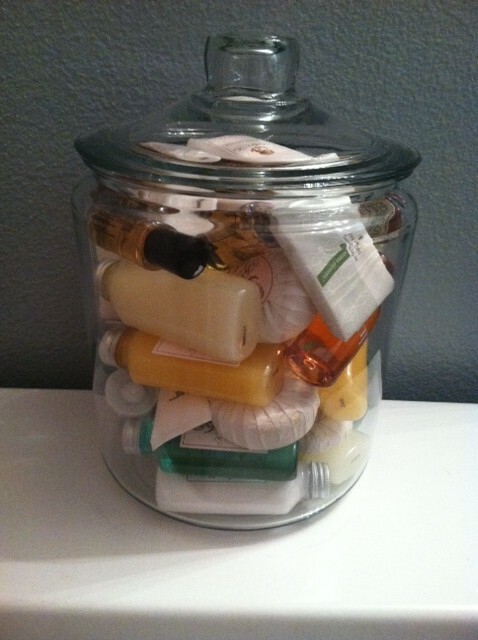 I bought this cute jar from Target and placed it above the guest bathroom toilet. Now guests don't need to ask for something if they left something at home! I use a bobby pin or two in my hair everyday. I feel like I am always misplacing them or finding them all over the place. Not any more! I found the perfect Pin-solution! 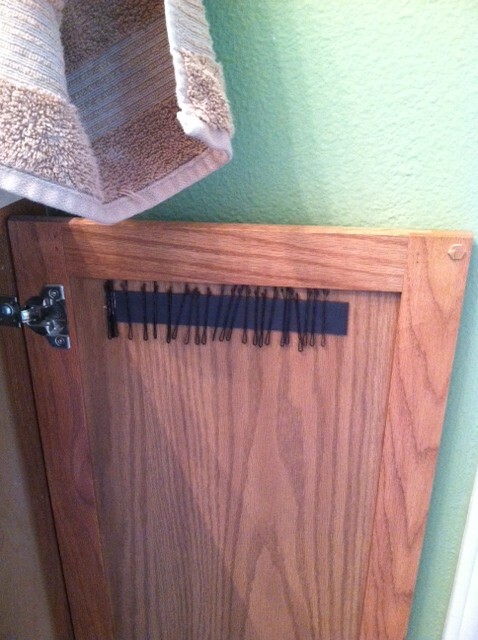 I placed a magnet strip, that I bought at Walmart, on my cabinet door and now I always know where my bobby pins are. WARNING: Don't use a band aid to hold up the sides until it fully sticks to the cabinet. The band aid does not come off of the magnet strip! If you look carefully you can see some pink Hello Kitty band aid still stuck to the left side. Whatever, I love Hello Kitty, she rocks and heals my cuts. I dislike hate mornings. I need an IV of coffee and a breath mint stat! Anything that makes my morning routine easier is A-ok in my book. 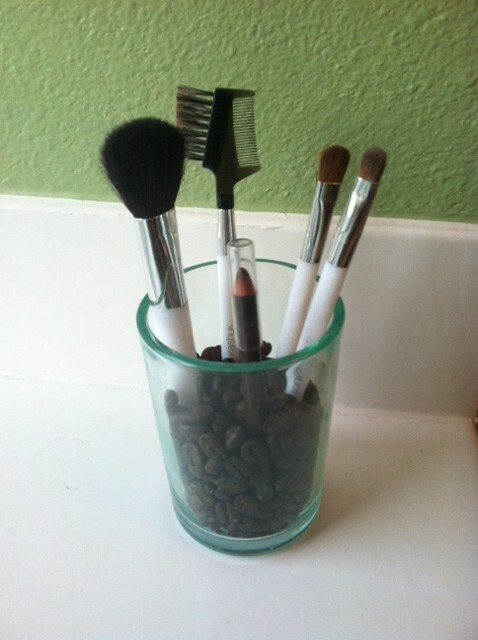 I found a glass that matches my cotton ball and toothbrush holder and filled it with coffee beans that hold my make up brushes. My brushes never get lost or dirty and the smell of the coffee beans in the morning is amazing. Until next time. Keep Pinning. I am what you would call a Pinterest fanatic. Every dish, craft or party I have put together for the last two years has roots in Pinterest. A little less than two months ago I got married, so of course I had a wedding full of ideas I got from from Pinterest users, here are a few. I knew from the beginning I didn't want to have a normal guest book. Who really sits down and reads lines and lines of names scribbled in a little white book. No-one, that's who. So when I saw a drinkable version of the guestbook I knew it was the one for me us. We created a bottle to open on our 5, 10, 15 and 20th anniversary. 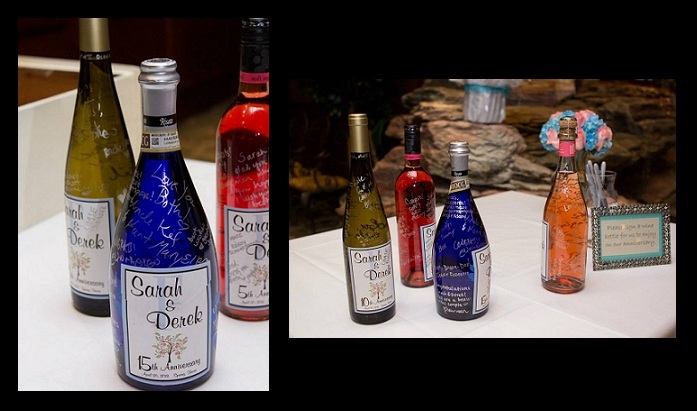 I cant wait to eat the top of our wedding cake and pop open the first bottle on April 20th 2014. It takes a village to help a bride navigate a wedding. I wanted to get my bridesmaids (21 and over), my friend who read a scripture during the ceremony and our florist a little something to say thank you. 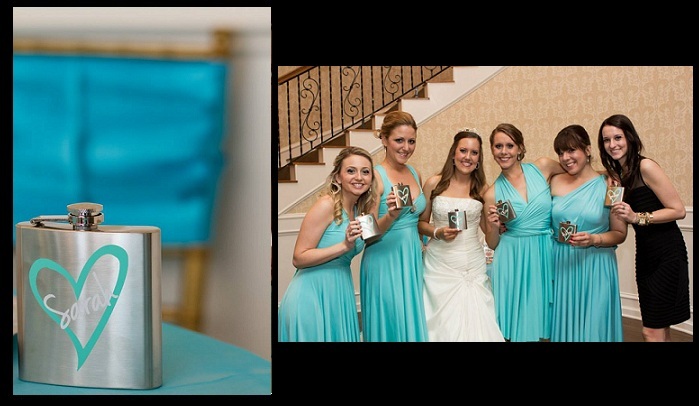 The gift had to be personalized and something they could use again, so what better then flasks! I purchased these flasks here. I'm sensing a boozy theme. How cute are we?? Moving on to a nonalcoholic topic. I needed a place for our wonderful guests to leave cards. 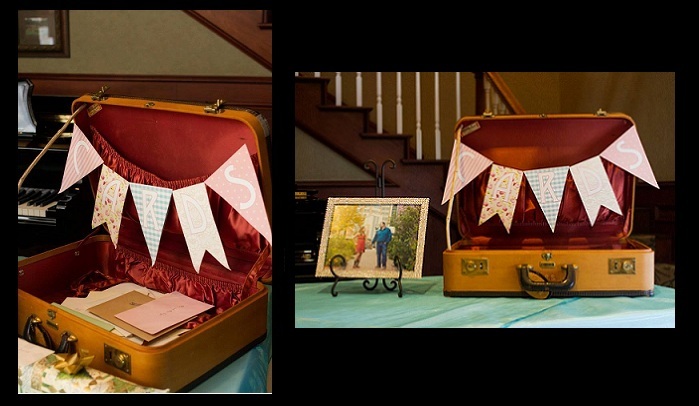 I thought about the typical birdcage or box until a ran across the perfect pin-solution, a vintage suitcase! My mom just so happened to have my great grandmothers suitcase with her initials MRS on it. Could it be anymore perfect? We got married outside which normally means your program, no matter how pretty, gets used as a fan. So when I saw fan-programs on Pinterest I knew that was the way to go! My bridesmaid, Lauren is a wonderful graphic designer. 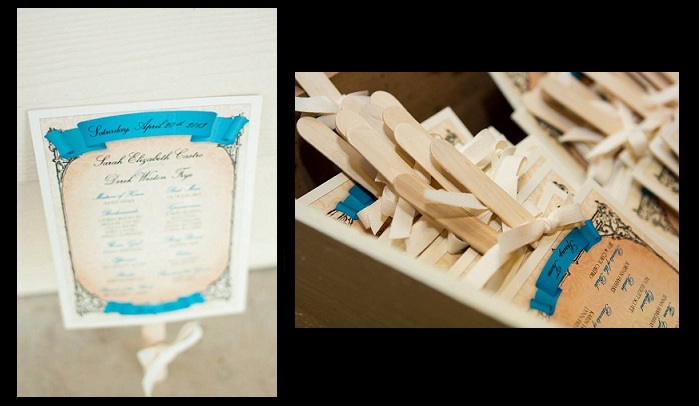 She was able to whip these up with the same theme as our wedding invitations. We displayed these in white vintage dresser drawers. WARNING: These were very time consuming to make! I recommend paying to have them made as fans. My mom and sisters were up until 2am the night before the wedding cutting and gluing when we should have been getting our beauty sleep! Well I could go on and on but Ill stop here for now...stay tuned! Travel theme. Theme images by belknap. Powered by Blogger.